The following was written during my time working with Sands Australia. It was published yesterday in The Adelaide Advertiser. FOR nine months I let a seed of doubt fester into believing I would never get to hold my child. It overwhelmed the confidence I wanted, so I felt guilty. The end result was that I barely let myself get excited about the prospect of becoming a father; that was until my son was born healthy last year. I suppose a small amount of concern for the wellbeing of my then-developing son was understandable and expected. Shortly after conception, most soon-to-be first-time fathers make a noticeable shift into protective parent mode. I was no different, but what I couldn't escape were the all-too-present recollections of grief and lost opportunity my partner and I endured early in 2012. Twice, two months apart - both miscarriages and both devastating. In Australia every year about one in five pregnancies end in miscarriage and about 2000 babies are stillborn or die shortly after birth. In the majority of these cases, the causes are never known - there are 10 times more unexplained stillbirths than there are cot deaths. In many cases bereaved parents spend the rest of their lives wondering what went wrong. Despite these seemingly high rates, pregnancy loss is such a taboo topic in society that many people are left to grieve alone. This is especially true for fathers. Before the first miscarriage, my partner and I had tried to fall pregnant for three months. Our doctor shared with us all the dos and don'ts of getting pregnant. We cut the don'ts out of our diet and did all the dos like our lives depended on them. We were so diligent we conceived rather quickly. A missed period tipped us off, and the required three-stick test confirmed it. I was on a high for days. I let myself celebrate by buying parenting and names books. Our families learnt the news, and I couldn't help let it slip to my close friends. Biologically, I had fathered a foetus. But, significantly, in mind and emotion, I was a parent. I imagined our child growing up well-educated and part of a loving family. More than a fortnight later, I hated myself for getting excited and carried away. The joy turned sour when scans revealed that at eight weeks, our baby had died. It happened again in August of 2012. Fortunately, I don't shy away from sharing feelings - no matter how vulnerable they make me - so I sought support from those close to me. I grieved openly. Like most men would, I felt a practical need to take some of my partner's grief away, though I knew I couldn't, and processed the news pragmatically. Importantly, though, I acknowledged the pain I felt, and shared it my own way. To get through a crisis, men traditionally forego tears with a stiff upper lip. Bereaved fathers too often turn to rigorous exercise or a vice for emotional support. They opt to muscle-up, drink up or bottle-up their emotions, rather than speak up and reach out for help. 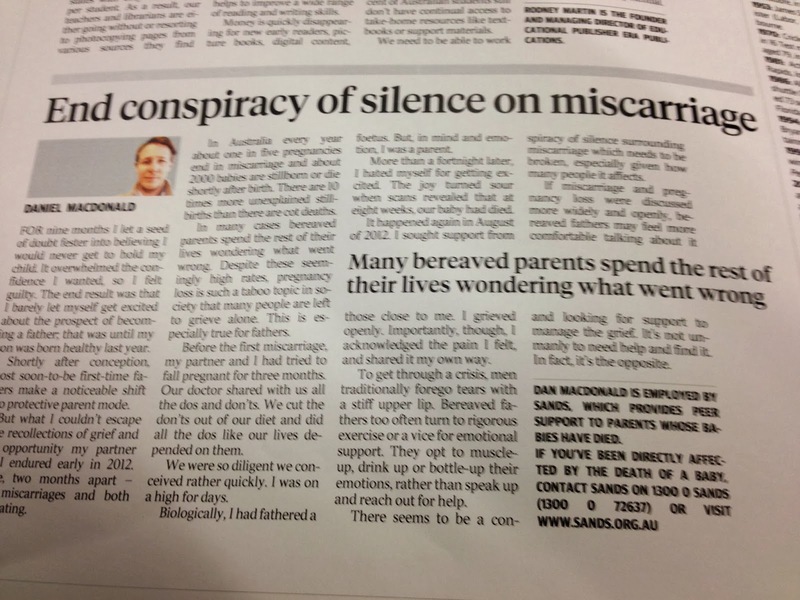 There seems to be a conspiracy of silence surrounding miscarriage which needs to be broken, especially given how many people it affects. If miscarriage and pregnancy loss were discussed more widely and openly, bereaved fathers may feel more comfortable talking about it and looking for support to manage the grief. It's not unmanly to need help and find it. In fact, it's the opposite. Dan MacDonald is employed by Sands, which provides peer support to parents whose babies have died. If you've been directly affected by the death of a baby, contact Sands on 1300 0 SANDS (1300 0 72637) or click here.